The sap is down but the sweetness is up, says the operator of the Dunn Family Farm. BUXTON — The cold weather may have reduced the flow of sap so far this maple season, but the sap that is flowing is extra sugary. That’s the word from Scott Dunn, one of dozens of sugarhouse operators who flung open their doors for the annual Maine Maple Sunday. “The trees are running very sweet,” Dunn said. While the Dunn Family Farm in Buxton had produced only half of what it did last season to date as of Sunday, the crowds descending on the Chicopee Road farm were larger than ever. 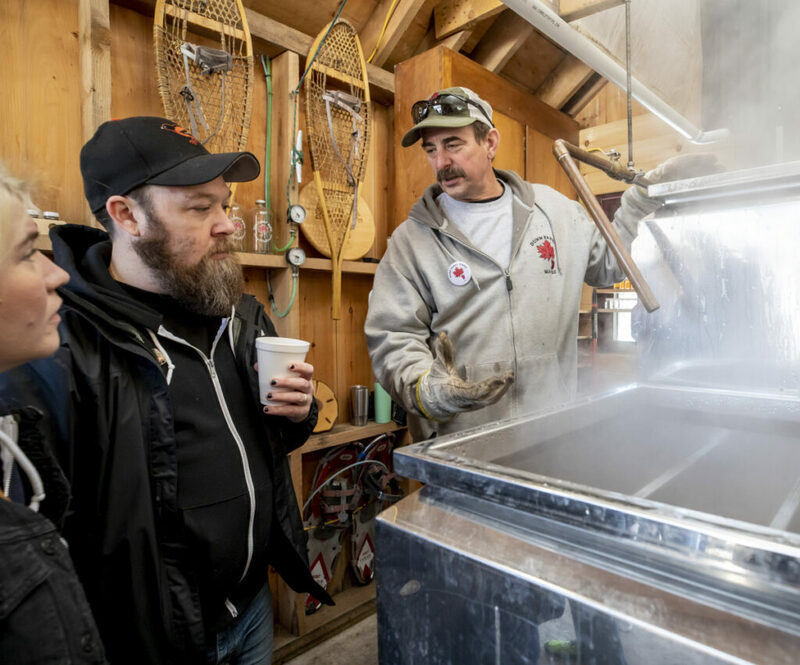 “The picnic tables were filled by 9 a.m.,” said Dunn, who has been boiling maple syrup since 2014. 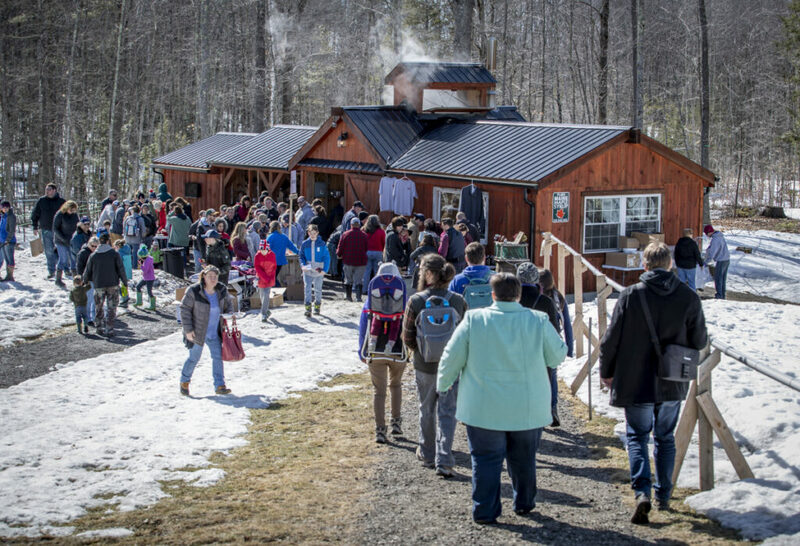 It was the same scene across Maine, with dozens of sugarhouses participating in the event, which typically includes a pancake and maple syrup breakfast, sap demonstrations and tours. Maine Maple Sunday has been celebrated since 1983. So many people show up at his sugarhouse that Dunn hires traffic details from the Buxton police and fire departments. A contingent of family members and friends helps keep the lines moving. Terry Deering of Gorham stood by the boiler answering questions. He said most people want to know how much sap it takes to make a gallon of syrup and how long it takes. He said those are not easy questions to answer because there are so many variables. This year the sap is running significantly sweeter than usual, so it is taking only about 35 gallons of sap to make a gallon of syrup, much less than the usual 40 gallons of sap-to-syrup ratio. As to another common question – is the steam from the sap good for the complexion? – Deering said he was stumped. This year at the Dunn farm the hot products were syrup in fancy glass bottles and mason jars. Dunn was also selling maple syrup aged for six months in whiskey barrels, which impart a rich, buttery taste to the syrup but no alcohol. Dunn said that after he is done with the barrels, they go to breweries, which are desperate for maple-cured barrels. Entire families show up to sample the maple products, including Tom and Caleigh Trask of Gray and their baby, Wren, 6 months. “We are starting a tradition,” Caleigh Trask said. “And I have got to have the real stuff,” her husband said. 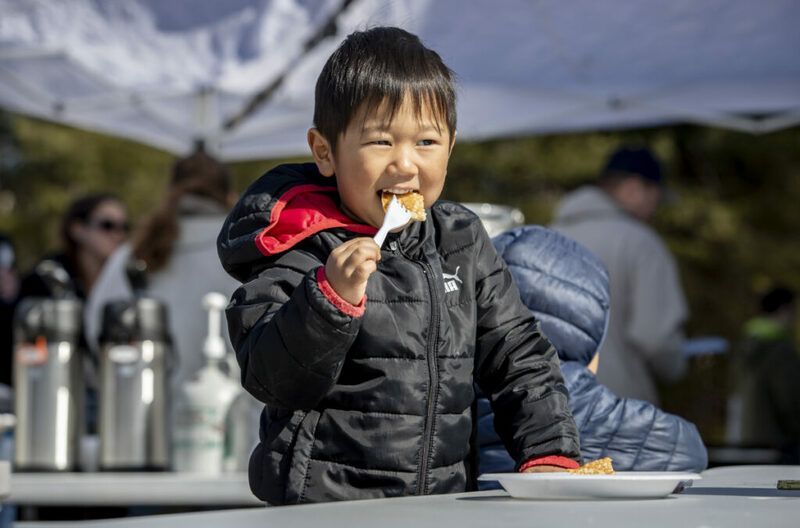 The Jamir family – parents Tia and Yashi and their sons, Ethan, 6, and Elliott, 5, who moved from Dallas to Portland in 2017 seeking a slower pace of life – were also at their first Maine Maple Sunday. “We are new to Maine so we are experiencing the Maine culture,” said Tia Jamir, who is originally from India. The family gave the event high marks. “We didn’t think much about maple syrup before we moved here,” Tia Jamir said. But now he realizes there is more to maple syrup than he originally thought. “There are too many choices,” he said.